When there is no more room in Hell Is For Hyphenates, the Paul shall walk the Earth. That was a bit of a switcheroo, wasn’t it? If you haven’t listened to the podcast yet, you might want to stop reading this and get on it. However, if you want to know the news but don’t care to listen to the show, it’s very strange you’re here, but also: Paul is leaving the show. Five-and-a-half years is a pretty impressive innings. In that time, Australia has had four Prime Ministers, so measured in those terms he’s been here for donkey’s. As he discussed in this month’s episode, there are a lot of factors. He will be leaving to focus his energies on his filmmaking career – prepping for Hell Is For Hyphenates requires a tremendous amount of time and energy – and decided that Lee moving to the UK would be a good opportunity to change things up. And that’s the other piece of news: Lee is moving to the UK. Because of that, it made sense that Paul’s replacement be someone who is based in the UK already, and we’ve been incredibly fortunate to secure the talents of our next host Sophie Mayer! Sophie is a film critic and author who definitely knows her away around cinema in all its forms and shapes. She’s the ideal candidate for the show, and we were totally delighted when she agreed to come on board. There’s going to be a lot of transition over the next few months. Hyphenates will migrate from an Australian-based show to a UK-based show, which will largely impact the film reviews as, out of necessity, we’ll start to go by British release dates instead. Our remit for the reviews is that we talk about films our audience has seen, and we hope the makeup of our audience doesn’t change despite this practical shift. We’ve also got a number of Australian guests who are booked into 2016. We book so far in advance, many of these guests were confirmed before we had any idea this shake-up would be occurring. We will continue to ensure that any podcasts recorded over Skype are mixed in a way that will trick you into thinking we’re all in the same room. But the real transition will be figuring out what the show is now. For the past five-and-a-half years, Hyphenates has been the Paul-and-Lee show, with each episode’s feel uniquely impacted by that month’s guest. It would be foolish to try to replicate that, and so we’ll be figuring out what the Sophie-and-Lee show sounds like. It’s going to be the exact same show, but totally different. Trust us on that. It’ll be exciting to mix it up, and we hope you stick with us as we figure out what this new iteration of Hyphenates sounds like. But enough housekeeping. Hyphenates has always been, and will continue to be, first and foremost a show about celebrating films and filmmakers. 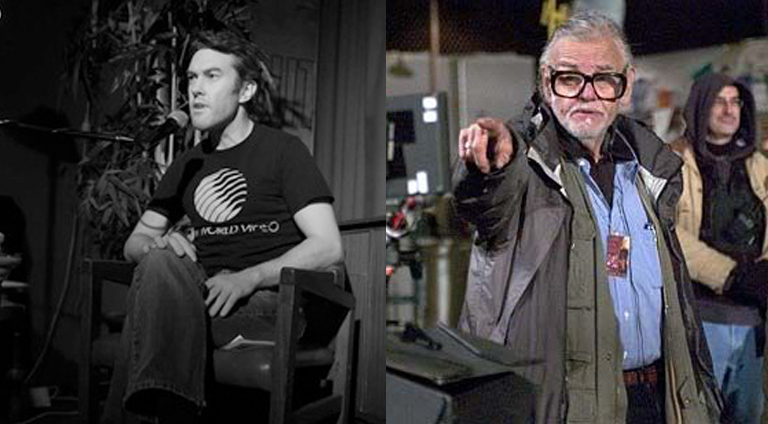 And this month, as Paul transitioned over the course of the episode from host to guest, we discovered one of his favourite filmmakers was in fact George A Romero. This came as something of a surprise to those who knew Paul to be a Tarantino-consumed child of 1970s New Hollywood. Surely, given QT has been covered on the show before, Scorsese would be the obvious choice? But although Paul’s love for Marty remains strong, it’s quite revealing to discover what it is about Romero that appeals to him so much, particularly as Paul embarks upon his own filmmaking career. We also look at the thematically-titled London Road, Ridley Scott’s The Martian, and Susanne Bier’s A Second Chance, and, to varying degrees, rave like lunatics about each one. This is a bumper episode – 1hr 32m – due to the fact that it’s Sophie’s first and Paul’s last, and that sort of momentous occasion deserves a bit of breathing room. So enjoy this month’s episode, and maybe leave Paul a farewell message on the episode, if you’re so inclined. We hope you enjoy the new iteration of Hell Is For Hyphenates! Outro music: score from Night of the Living Dead (1968), taken from stock music composed by either Harry Bluestone, Emil Cadkin, Jack Cookerly, Ib Glindemann, Philip Green, Geordie Hormel, William Loose, Jack Brunker Meakin, Spencer Moore or John Seely! …the shot in question is embedded below. Antagonist George Stark said that he’d castrate a character and place the… cuttings in said character’s mouth. But how do you show that in an early 1990s mainstream film? Watch the way he orchestrates the characters, moves the camera, and ingeniously reveals the gruesome display. It’s masterful stuff. This entry was posted in blogs and tagged george a romero, paul anthony nelson on September 30, 2015 by The Hyphenates.